Sharing a Dream in Cabo San Lucas - What's YOUR Dream? 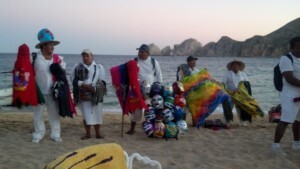 Home » Blog » Sharing a Dream in Cabo San Lucas – What’s YOUR Dream? There are a few things you’ll see everywhere you look when you’re in Cabo San Lucas. Sun, sand, ocean, and vendors selling their wares. On the beach, in the streets, everywhere. Jewelry, sunglasses, blankets – whatever a tourist can dream of – there’s someone ready, willing and able to sell it to you. We were out to dinner at one of the restaurants downtown. Mark and I like to sit out on the patio and people watch. Being a part of the buzz in a city is all part of the fun in our opinions. So it was on the last trip to Cabo. After we ordered, we saw one of the vendors approaching. There’s almost a knee-jerk reaction to shake your head and say “nada gracias” to send them on their way. But this one was different. His approach was sweet, so I waved him over to take a look at his earrings. We started chatting. He showed us his license that gives him permission to work the restaurants. He told us how he made the earrings himself. We chit chatted for several minutes. I asked him questions about his dream. He told me what he intended to name it, how he would run it – the works. But the best part of the conversation was the light in his eyes. I couldn’t help but to want to play a role in some small way in helping him make his dream come true. So we did the only thing in our power at the moment – we bought a couple of pairs of earrings. I may not be able to see Ricardo’s dream come to fruition. But I became his customer that day. I am hopeful that the earrings I bought, combined with any others he sold that day, will help him make it through the day. And I hope he is able to save and make his dream come true. So I couldn’t help but to write about this exchange with Ricardo in Cabo San Lucas. I bought from him – not because I wanted or needed another pair of earrings – but because I wanted to be a part of something bigger. I wanted to be a part of his story – his dream. I have to turn around and ask you – what’s your dream? Are you sharing it with others? Because if you aren’t, you are robbing them of being a part of something bigger too. And you never know how many small gestures will add up to seeing YOUR dream come true. And you never know just how God will bless YOU when you share your dreams – and you never know how God will bless OTHERS through their ability to be a part of your dream.